On Monday, Nov. 26, nine amazing people swore an oath in front of family, friends, and the family court judge to always speak up for the best interests of children in foster care. 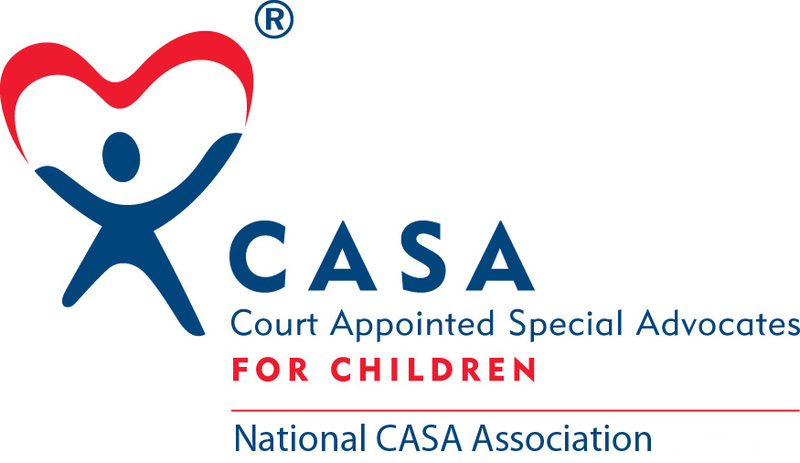 Passaic County CASA is happy to welcome the new Court Appointed Special Advocate volunteers to the CASA team: Jacqueline, Denise, Ginnie, Patty, Keisha, Danielle, Darrin, Michele, and Bernie. On Wednesday, October 24, Passaic County CASA was honored to host an “Ask the Judge” Volunteer In-Service with Passaic County Superior Court Judge Imre Karaszegi. The evening provided an opportunity for CASA volunteers to hear a judge’s perspective firsthand on topics ranging from Court Reports, to soliciting a child’s opinion/involvement in case decisions, non-compliance of parties on the case, and many other topics. The approximately 4,800 miles that separate Sofia, Bulgaria, from Wayne, New Jersey is just a portion of the journey that our October 2018 Volunteer of the Month, Desi Stefanova, traveled on her way to becoming a CASA. Talk to Desi and she’ll tell you about leaving Bulgaria when she was 21 to pursue a work exchange program in Michigan. Then she lived in Rhode Island and Massachusetts, followed by law school, jobs, and more travel. It is easy to imagine that Desi has seen and experienced life in more places than most people do in a lifetime. Thankfully for CASA and the children Desi would eventually serve, life settled down a little for her when she moved to New Jersey. She had first learned about CASA’s volunteer program during her time working as a family court clerk, and decided the time was right to give back. As she recalls her early years in the United States, she remembers “knowing what it means to be alone and afraid.” Her hope was to help others avoid a similar fate. Initially Desi was concerned that not having grown up in the United States would impact her ability to be an effective CASA volunteer. She remembers being concerned about the differences between the school system she knew in Bulgaria and the ones she would need to navigate here. Looking back, these differences were easy to overcome. Desi credits the “amazing support” she has received from her Case Supervisors in confronting these (and other) hurdles. Over the past 16 months she has taken on four cases, and has served as advocate for a total of five children. Having lived in many different places gives Desi a unique perspective on the forces impacting the children and families on her cases. In particular, she’s keenly aware of how poverty is often at the root of so many problems and how difficult it can be to escape its long-term effects. She strives to not see things as black or white, and instead to appreciate all the circumstances that can factor into her cases. Indeed, Case Supervisor, Michelle Schaefer cited Desi’s ability to skillfully navigate sensitive situations and challenging individuals with patience and sensitivity, taking into account different perspectives and cultures. 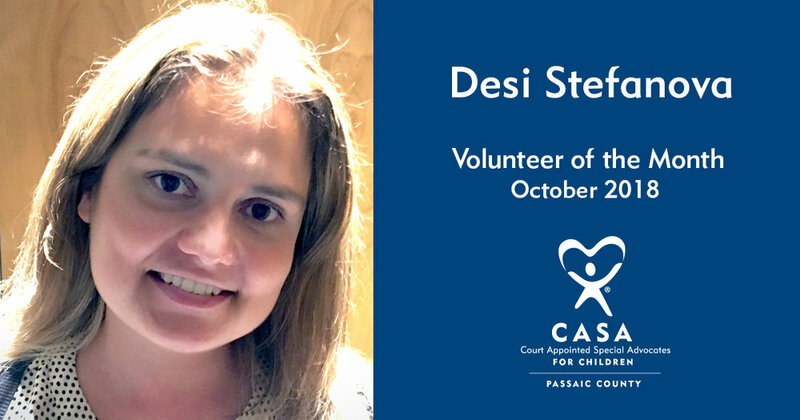 "Desi is a role model among CASA volunteers, and her professionalism, sensitivity, and diligence have made her a strong advocate for each of her children. We are lucky to have her!" Desi’s devotion to the children on her cases is apparent. She lights up when talking about the children she’s gotten to know as an advocate. For someone who has traveled so much and had so many homes, clearly her joy comes from helping children find theirs. Choosing a Voices for Children Honoree for Passaic County CASA’s 2018 Voices for Children Gala was an easy decision for Executive Director Erica Fischer-Kaslander and the members of the Passaic County CASA Board of Trustees. Anyone who has spent any time at all at the CASA Office at 415 Hamburg Turnpike has seen Andrea coming and going, often carrying Tricky Tray supplies or donations. New staff members and interns are introduced to Andrea as an “unpaid staff member.” With her infectious laughter, easy warmth, and a funny anecdote always ready to share, Andrea is an invaluable part of Passaic County CASA. This Paterson native recalls growing up “in not a good area” where violence and drugs were commonplace. Thankfully, Andrea had a large, close-knit family to rely upon, who she credits with keeping her focused, working hard, and safe from the dangers around her. She eventually left Paterson in 1978 for a home in the suburbs of Morris County, where she raised a family of her own and had a successful career in pharmaceuticals, information systems, and real estate. In addition to being unafraid to speak her mind, Andrea is the kind of person who sees what needs to be done and just does it. One time, that even meant drawing upon her skills in the kitchen. Andrea’s CASA children had recently moved to New Jersey from Somalia with their parents, and after some allegations of parental neglect, the children ended up in foster care, where they developed a taste for American food. When the family was set to be reunited, the mother wanted to learn how to make some of the American food their children had learned to enjoy, like hot dogs, macaroni and cheese, and spaghetti. So Andrea, while freely acknowledging she’s no chef, volunteered to help the mom learn how to cook these basics. Clearly Andrea is willing to go the extra mile for the children she advocates for. Another example of going the extra mile comes around every June, although for Andrea the work begins months beforehand. Under Andrea’s leadership, Passaic County CASA’s annual Tricky Tray fundraiser has grown into a massive event involving the coordination of an army of volunteers and countless hours of work. Only someone like Andrea could muster such support from so many people, businesses, and organizations in the name of children in foster care. Her warmth and passion for helping children is infectious, inspiring those around her to pitch in whatever they can. For these reasons and many others, it seemed like high-time to recognize Andrea for everything she’s done over the past nine years for Passaic County CASA and children in foster care. Andrea is proof that one person truly can make a difference, and that we all have unique gifts to offer up for a good cause. We are honored to thank such a dear supporter and friend with our Voices for Children Award. One day recently I was moving items stored in one of the many containers of mementos and memories from childhood, high school, and college which I have saved. Out of nowhere, a very familiar necklace fell on the floor to my feet. Immediately I caught my breath and had to wonder, where did a necklace come from out of a trunk full of old sweatshirts, plaques, and photographs? Weathered and worn, the silver heart charm on a chain isn’t valuable in a monetary sense but the memories attached to it are priceless to me. I remember looking for it about 10-12 years ago and after turning every practical location upside down, I wrote off finding the necklace. It would have to live on as a memento from my distant past, something which would fade away along with the memories. Now, to realize it had been hiding in the depths of my trunk for all that time, only to show up at just the right moment in life, gave me a moment of reflection. Finding this necklace last week was a bittersweet reminder of the innocence of childhood, the fragility of our memories, the strength of friendship, and what should be. I wore my necklace all week at the CASA office as I revisited my own memories and worked on the case of one long-term CASA youth, Sherry. I met Sherry five years ago when she entered foster care at age 11 due to her mother’s severe abuse. I couldn’t help but think she will never even have the faint hope of rediscovering a lost gift full of memories from a cherished friend like I did this week. Since entering foster care, Sherry has lived in 15 different places and attended 5 different schools. She has lived in 3 places in the last month alone. At age 16, she is roughly the same age that I was when I made the wonderful memories I have linked to that necklace. However, instead of making unforgettable memories, Sherry is living day-to-day to survive in foster care and hoping to live long enough in one place to enroll in school. Having a close supportive group of friends to create those memories with is the farthest thing from Sherry’s imagination. Every time Sherry has moved, her items have either gone into storage here at the CASA office or often get lost. Keeping something as small as a necklace over many years would be a miracle. Even though she may not have mementos like my necklace as an adult and making friends like many teenagers have been difficult, there is one thing that has stood out from Sherry’s story- her CASA volunteer. For over 5 years, her CASA volunteer Pat has stood by her side through every placement and school. The challenges which have prevented her from reaching a safe and permanent home have not been easy and the road has not been smooth. However, just like my best friend from childhood who gifted me that heart, Pat continues to be reliable and have the steadfast endurance despite the bumps the road. I did not set out to make a comparison between the two, but the similarities are striking. Though the precious metal of my heart necklace has shown wear and developed character from its age, it still remains strong- just as Pat’s advocacy does each day for Sherry. Just has as I rediscovered my necklace 10 years after thinking I had lost it, only to be reminded of a well-worn but treasured friendship, hopefully, Sherry will similarly reconnect with Pat in the future and recognize that despite the struggles, the strength of Pat’s advocacy remained strong. Speak up for a Child Today. Passaic County CASA - 415 Hamburg Tpk, Suite D2, Wayne, NJ 07470 "973-832-4002"